← Will QR Code Technology Provide Contractors Quick Relief in Filing Preliminary Lien Notices? Is As-Built Drawing Preparation a Lienable Activity? 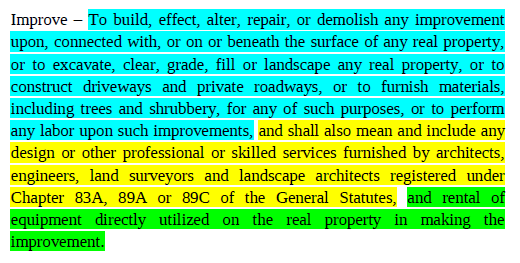 In blue, you’ll see the portion of the definition applicable to contractors. In yellow is the portion of the definition applicable to design professionals. In green is the portion of the definition applicable to rental equipment suppliers. The majority opinion in the Ramey Kemp decision focused on the yellow portion of the definition in holding that the preparation of a status update letter is one of the “professional or skilled services” typically performed by design professionals, and is therefore lienable. The blue portion of the definition, however, is what applies to building contractors. That language does not give me a level of comfort that as-built preparation is a lienable activity. In blue, I only see language related to on-site work on the property itself; I don’t see language related to the paperwork that might arise from that on-site work. So while the COA has held that a design professional’s paperwork constitutes an “improvement” to real property, I think a contractor would face an uphill climb proving that its paperwork can be similarly classified. Bottom line, the Ramey Kemp decision hasn’t changed my view about how general contractors should calendar their lien deadlines. Indeed, my general rule-of-thumb remains unchanged: calendar the 120-day mechanics’ lien deadline from the date of your last performance of on-site, pre-substantial completion, non-punch list work. Yes, a strong argument can be made that legitimate punch list work performed post-substantial completion is a lienable activity, and I’d be very comfortable defending that position in court, if the need were ever to arise. But when it comes preserving statutory lien rights, and given how strictly courts tend to apply mechanics’ lien statutes, the conservative approach is always the best. So determine the date your last sub — or your own crew, if it self-performed the last project activity — completed non-punch list work, count 120 days from there and mark your calendar accordingly. Better still, run that proposed deadline by an experienced construction lawyer to ensure that all unique facts are considered and your mechanics’ lien rights are adequately preserved.